The Italianate house, with a mansard roof, in the foreground was at 47 Jefferson SE, at the corner of Island (now Weston). It was the home of Frank L. Carpenter in 1912. Across the steet at 54 Jefferson Ave., partially hidden behind trees, stands another Italianate mansion with a mansard roof. The former Nelson Howlett home was a three story red brick building at the NE corner of Jefferson and Washington St. The one-story building at the SE corner of Jefferson and State St. is that of Barton A. Spring Co., funeral director. The building in the distance, showing above the trees, is St. Mary's Hospital. The cars, which appear to be of late 1920's vintage, determined the date of the photo. The site of the former Carpenter home is now occupied by expanded facilities of Westminster Presbyterian Church. The Board of Education purchased the Howlett house in 1903 for $25,000 to house the Kent Scientific Institute, which at the time was located in the high school at Ransom and Lyon. At the time of this photograph the former Howlett house was known as the Kent Scientific Museum. 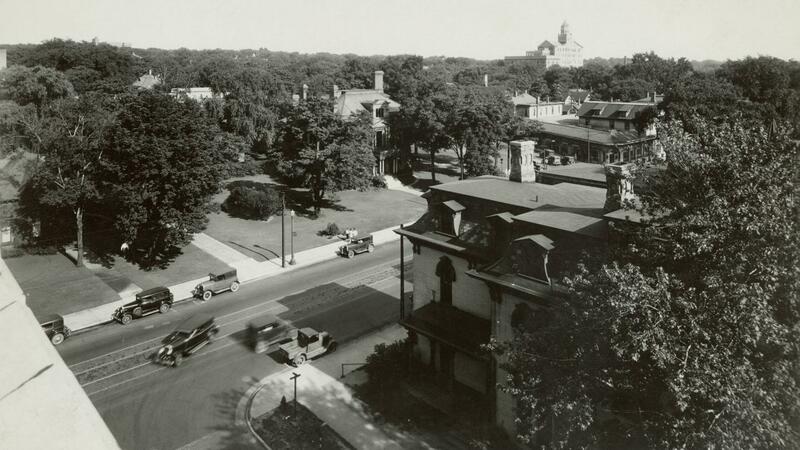 The building was removed in 1937-38 to make room for the new Grand Rapids Public Museum. Copyright Grand Rapids Press. This image was reproduced with permission from the Grand Rapids Public Museum. Photographs may not be reused without permission and must credit the "Collections of the Grand Rapids Public Museum." For rights and reproduction information contact: Grand Rapids Public Museum, Collections Department, 272 Pearl Street NW, Grand Rapids, MI 49504: Phone 616-929-1809.